Allegedly haunted by medieval ghosts, Ross Castle sits on the edge of Lough Leane, one of three interlinked lakes within the country's most popular national park. Built in the 15th century by the region's ruling O'Donoghue clan, the castle was among the last places in Ireland to succumb to the forces of Oliver Cromwell, who occupied the country in 1650. The castle's cunning defensive features include a spiral staircase designed with each step a different height, which helped trip up would-be attackers for over a century. You can see the unusual staircase and rooms filled with 17th century oak furniture by guided tour only, so be sure to book your tickets well in advance. A visit to Ross Castle represents just the start of the adventure when you use our Killarney trip builder to plot your vacation. Ross Castle is a stunning place to visit and whilst we didn’t actually venture into the castle itself, the grounds alone were stunning and full of life. There were activity groups for schools/colleges happening whilst we were there and it was great to see the site being used for other, active purposes than just visitors. We sat out on the grounds, in the sunshine and enjoyed a picnic. Well worth a visit. Nice little castle, with tours led every 40 minutes. Small snack shop on site, and boat tours leaving regularly. Limited parking available nearby. Some of the grounds can be accessed for free, whereas the tours inside the castle are paid only. Unfortunately there is no access inside the castle aside from the tours. Toilets available in site, and reasonably clean. Horse drawn carriage rides also available from very close by. Beautiful castle although we did not pay the fee to go inside. The history of the place is so interesting and the surrounding grounds are beautiful. Our only complaint is that we did not have more time in Killarney to explore all that it has to offer. Our next trip to Ireland we will definitely be spending a few days to explore the city and parks! What a beautiful town it is! Loved the day we spent here. We rented a canoe and paddled out to see ancient ruins on a small Island and enjoyed the informative tour of the castle it's self. What a great day! Ross castle is super close to Killarney and yet perfectly distant in time. The site has been meticulously restored and is extremely realistic (less the stink and filth). There tours are reasonably priced. The site can be visited externally for FREE! Well worth your time. Every day, we help thousands of travelers plan great vacations. Here are some tips on how to use your Listing Page to attract more travelers to your business - Ross Castle. Promote your permanent link - https://www.inspirock.com/ireland/killarney/ross-castle-a58176081 - on your website, your blog, and social media. 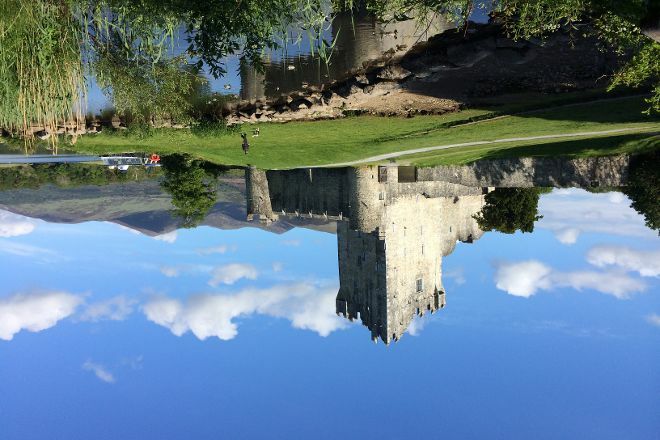 When a traveler builds a plan from this page, the itinerary automatically includes Ross Castle. This is a great way for travelers looking for a great vacation in your city or country to also experience Ross Castle. Promoting your link also lets your audience know that you are featured on a rapidly growing travel site. In addition, the more this page is used, the more we will promote Ross Castle to other Inspirock users. For best results, use the customized Trip Planning Widget for Ross Castle on your website. It has all the advantages mentioned above, plus users to your site can conveniently access it directly on your site. Visitors to your site will appreciate you offering them help with planning their vacation. Setting this up takes just a few minutes - Click here for instructions.